Food is displayed on shelves at a grocery store in Miami. America’s “food recovery” has begun, with fewer people struggling to put food on the table and fewer receiving food stamps. But these welcomed trends mask wide variation across states in people’s access to food — New Mexico and Oregon have more residents using food stamps relative to their needs than Wyoming and Utah, for example. These trends were evident in a report released Wednesday by the U.S. Department of Agriculture. It showed that the proportion of households classified as “food insecure” declined to 14.3 percent last year — its lowest level since 2007, down from its peak in 2011 of 14.9 percent. Food insecurity is a survey-based measure, defined as the percentage of households “uncertain of having, or unable to acquire, enough food to meet the needs of all their members.” The proportion of households experiencing food insecurity most acutely, classified as having “very low food security,” was essentially unchanged last year at 5.6 percent, down from a peak of 5.7 percent in 2011. Both measures of food security, however, are still much higher than pre-recession levels, which were about 11 percent and 4 percent, respectively. In North Dakota and Virginia, though, fewer than 1 in 10 households are food insecure. The hardship is more prevalent in poorer states, such as Arkansas and Mississippi, with more than 1 in 5 households unable to adequately feed their families. And poorer states tend to have a higher number of people who use the Supplemental Nutrition Assistance Program (SNAP), commonly called food stamps. 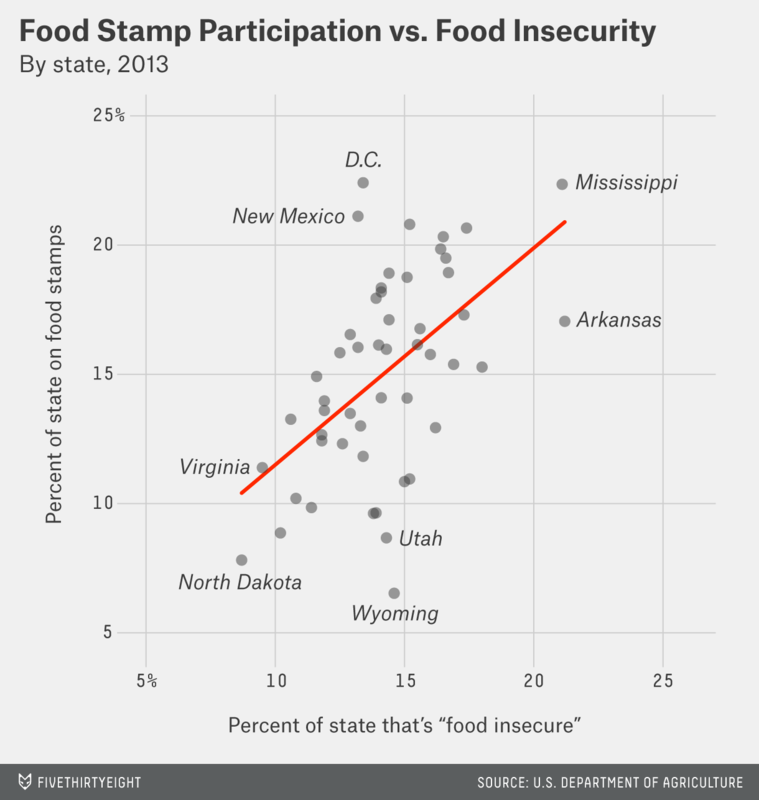 This positive relationship between food insecurity and food stamp participation makes sense. States with a greater number of people going hungry are likely to have a greater number enrolled in SNAP. As you can see in the chart, some states deviate significantly from the trend line. For example, in Wyoming, you’d expect more people — nearly 50,000, according to our calculation — to be using food stamps given the number of residents who are struggling to feed themselves or their families. Whereas in New Mexico, you’d expect a lot fewer people to be using food stamps — about 145,000. States differ in how they define income and household assets, which affect a family’s eligibility for food stamps. For example, states can set the gross income thresholds to be a SNAP recipient, but the federal government sets the net income requirements. Perhaps more importantly, states vary in how they administer and enroll participants, according to Stacy Dean, vice president for food assistance policy at the Center on Budget and Policy Priorities, a think tank. Dean said some states offer residents easier ways to apply for the benefits, as well as do more aggressive outreach to those in need. Of course, culture and the perceived stigma of government assistance could matter, too — and in some ways, they are the most hard to quantify. “Some people wait until they’re incredibly food insecure before applying” for benefits, Dean said.